I met this gentleman on Saturday afternoon while he was waiting for the bus at the corner of Genesee and Herman Streets. He told me his name was Black Knight. I asked him what he thought of the $320,000 demolition of the Brecker Building less than 100 feet away from where we were standing. This is what he told me. For more information about the Brecker Building and its storied past, please see this recent post Loft Living or Landfill from earlier in the month. Remember the Brecker Part I and Part II have links to demolition pictures. 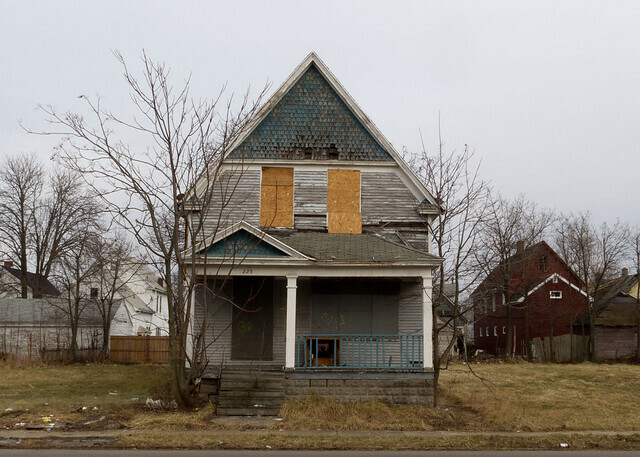 Buffalo's Vacant Property Crisis: Coming Up Empty? 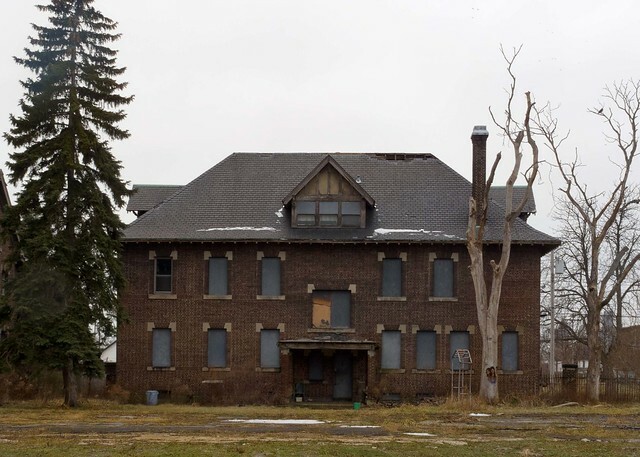 The latest issue of Buffalo Spree Magazine has a roundtable discussion addressing Buffalo's most pressing urban crisis - vacant property. I received a scanned copy of the article today. Here's the text - page 1, page 2, page 3, page 4 and page 5. Six years ago I posted Getting Smarter about Decline. I included links to LISC Buffalo's new ground breaking analysis and bold policy initiatives: Blueprint Buffalo. 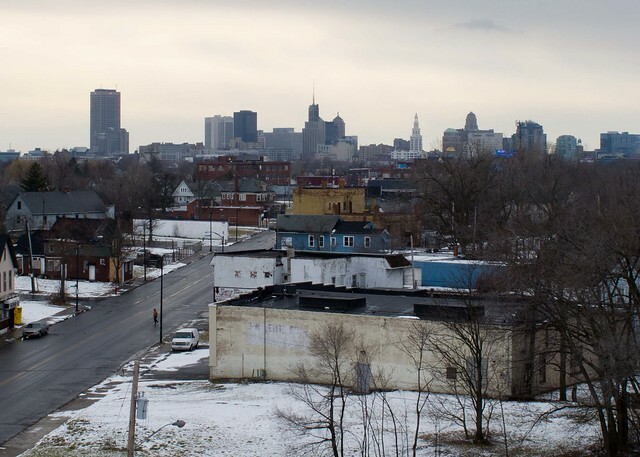 LISC and PUSH Buffalo are still at the edge of intelligent analysis and developing coherent action plans for dealing with the City's abandonment and vacancy problems. 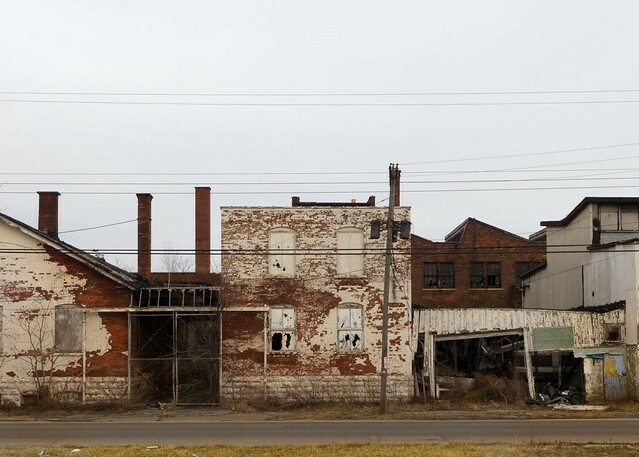 Aaron Bartley's recent article in the Huffington Post - Rust Belt Cities and the New Urban Agarianism - spells out the problems and some of the smart new solutions that are appearing on both sides of Main Street. Since 2006 there's been little movement on establishing an intensive level street survey - door to door analysis - of the City's vacancy problem. As more people leave the City, they leave behind empty houses. Counting the vacant houses will reveal the magnitude of the problem. Short of an intensive level street survey, we're playing guessing games. 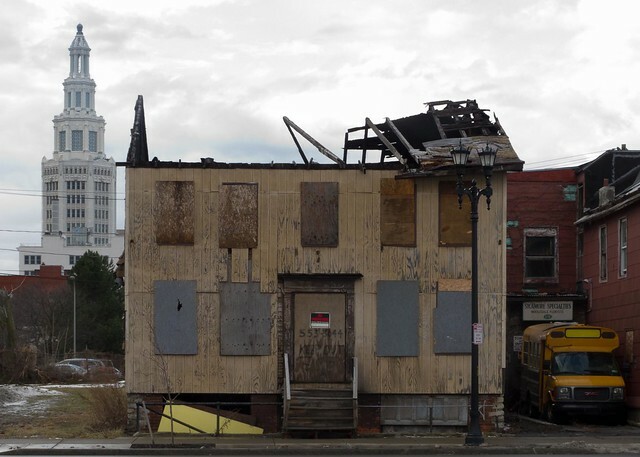 Update 2/27/12 at 12:15pm - Additional resources for understanding the extent and magnitude of Buffalo's vacant property crises are available in this post - Vacant/Undeliverable - from 2010. I'd linked to the Buffalo Vacancy, a wiki site maintained and currently updated by Anthony Armstrong, Program Manager at LISC Buffalo. In addition there's a short video in that post which is part of Laura Underhill's graduate work at North Carolina State, showing the extent of vacancy in the City's Cold Springs neighborhood. To see the individual photos and related maps, follow this link or you can view the series as a slide show. A dozen people showed up this morning to witness the demolition of a fabulous City-owned building. YNN, Channel 2 and Fillmore District Council Member David Franczyk also stopped by the Brecker building today. By 2 pm crews were wrapping up for the day. Here's what remains after the first day of this $320,000 emergency demolition. Jerry Williams from Niagara Falls, NY based Apollo Demolition informed me that demolishing the Brecker is expected to take ten days. 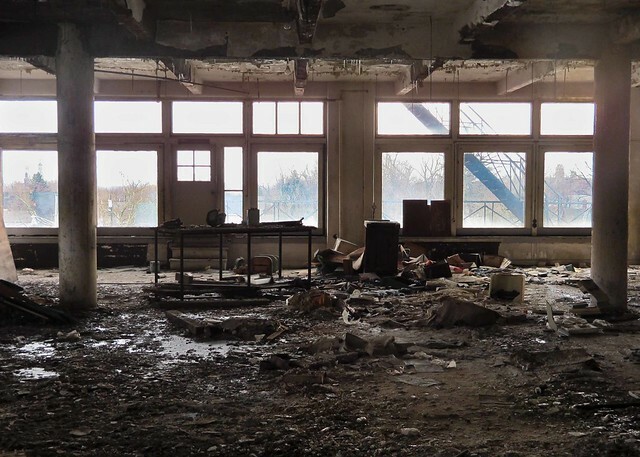 For additional information about the Brecker Building make sure to check out this recent post - Lofts or Landfill and Remember the Brecker: Part I. See the Brecker Building demolition flickr archive for additional pics. 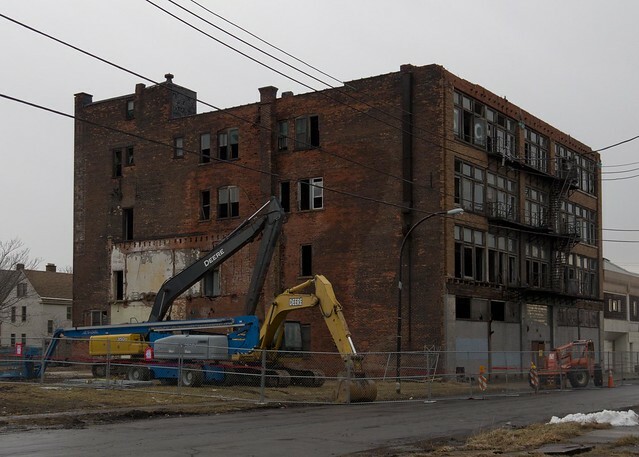 Demolition crews arrived at the City-owned Brecker Building on Friday morning. Bricks began falling from the buildings facade during the last few weeks and City officials decided to have the building demolished. 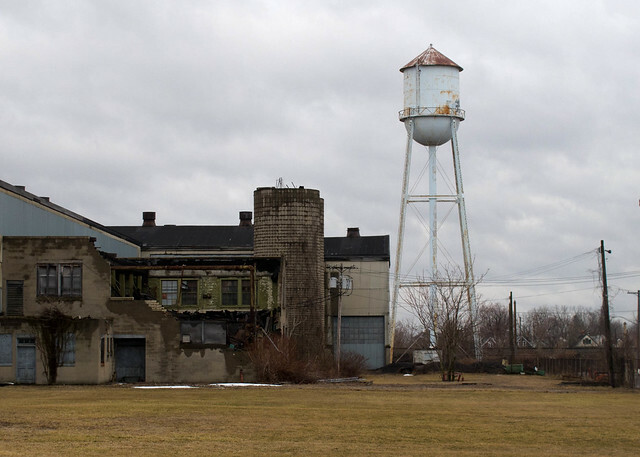 The City of Buffalo is paying Apollo Demolition $320,000 to haul one of the last spectacular steel reinforced concrete buildings on the City's East Side to the landfill. The Brecker is located at 630 High (google map). I've collected a number of additional images from Friday afternoon in this Brecker Building demolition flickr archive. 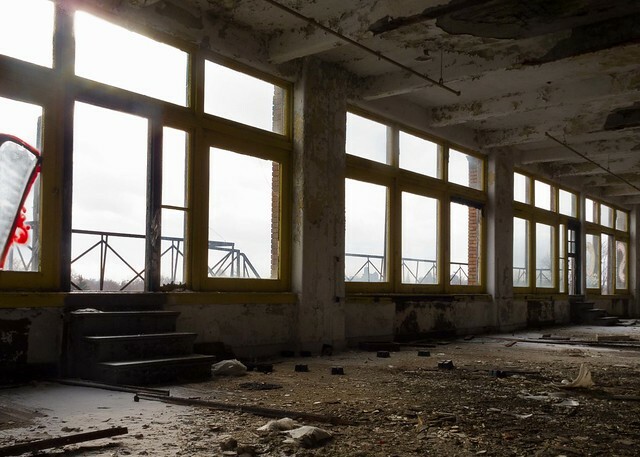 If you're not already familiar with this historic building and some of the stories contained in its walls, please check out this post from earlier in the month: Brecker Building: Loft Living or Landfill. Once the preparations are complete the demolition is scheduled to begin Saturday morning. 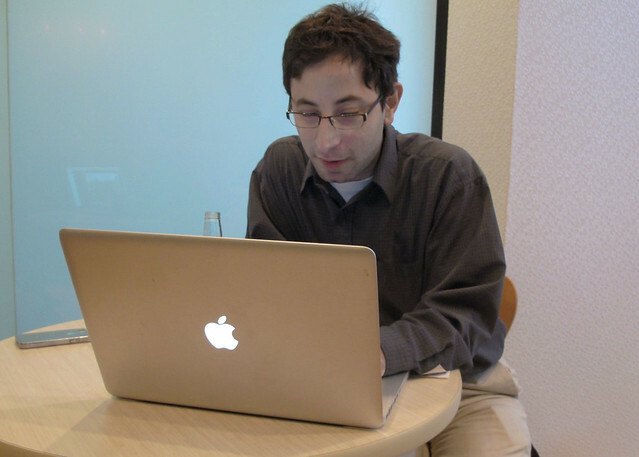 While the demolition crews prepared to demolish the building a Facebook Event was generated - Remember the Brecker. While discussing the schedule with the demolition crew, I learned that this emergency demolition is also a controlled demolition. This means that nothing can be salvaged. When I was in the building two weeks ago I remembered noticing the transom windows and their square prismatic pieces. These are headed for the landfill. While thinking about the Brecker's additional architectural detail and storied past I was struck with fact that Verlyn Klinkenborg's The Last Fine Time (1990) is set one block away on the corner of Herman and Sycamore. Please join us on Saturday morning as we bear witness to the destruction of the Brecker Building. Cephas Buffalo, Inc. purchased the former St. Peter & Paul School from the Diocese of Buffalo in 2010. 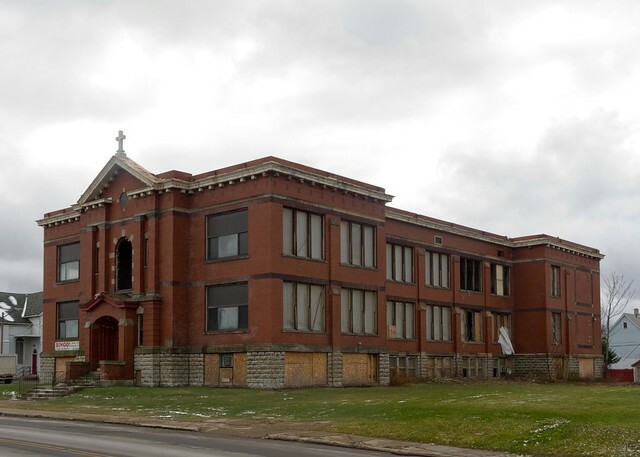 The former Catholic elementary school, located at 807 Clinton Street (google map), sold for $100,000. According to this Buffalo News story, demolition of the school building is expected to be completed by next week. 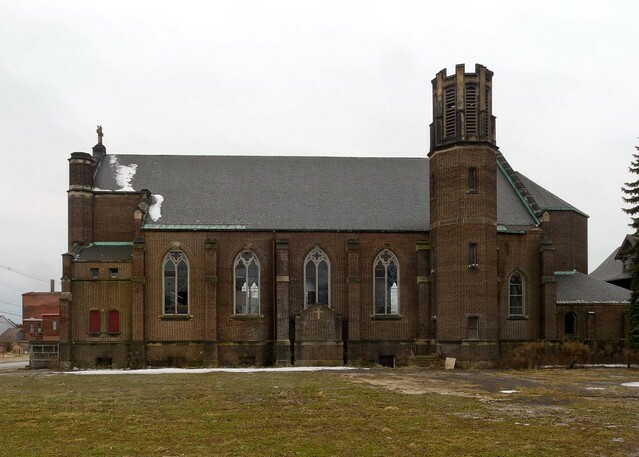 The City's Preservation Board approved the demolition of St. Peter & Paul's school in December 2011. Ten days ago the City issued the demolition permit. Records indicate that Cephas is paying $119,000 for the demolition. 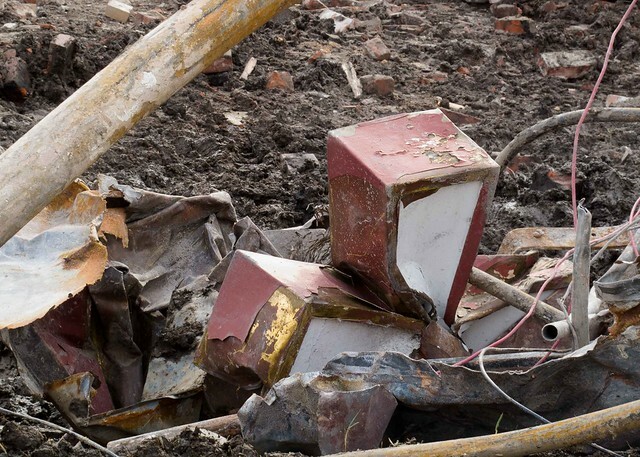 A number of observers have told me that valuable materials including slate chalk boards, priceless woodwork and desks were destroyed and trucked to the landfill. 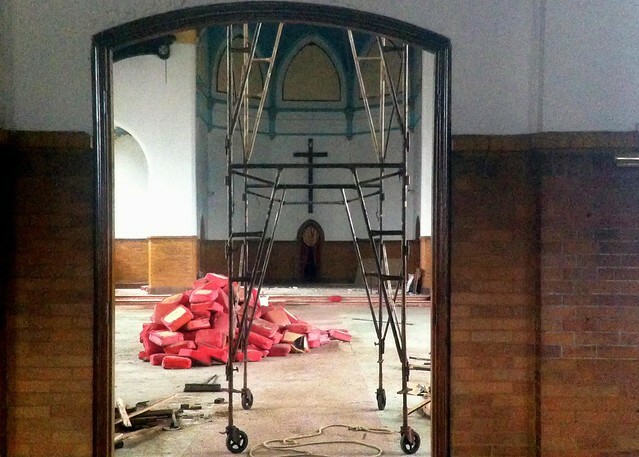 The cross that once adorned the school's entrance was found crushed yesterday (image below). Cephas Buffalo is expanding its post prison ministry and plans to renovate the former parish rectory next door to the former school. If you're not familiar with their mission this short video provides a good introduction to Cephas and the work of Franciscan Brother Michael Oberst. Additional St. Peter & Paul School images are available in this flickr archive. Last week I posted a google map pin-pointing the 68 demolitions slated for the City's Ellicott District - The Bulldozer's Newest Map. Most of these are residential properties and three of the City's heritage buildings are being readied for the landfill. That short list includes: School #75 on Howard Street, Sacred Heart Church on Emslie and related parish buildings. The City's oldest synagogue (and designated local landmark by the City's Preservation Board) at 407 Jefferson Avenue is also threatened with a demolition order. The comment stream around a number of the West Side properties on that list is growing. 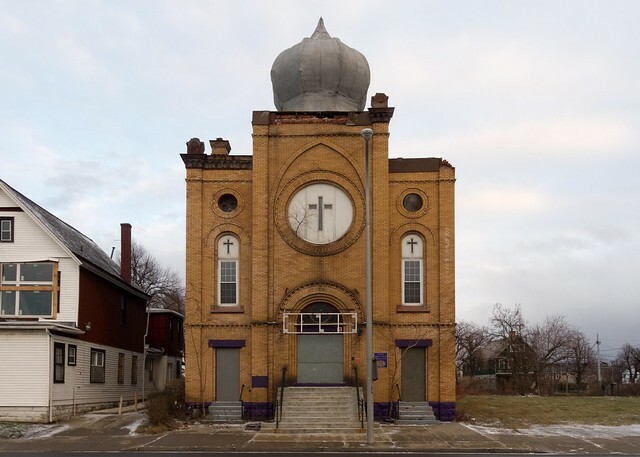 In case you missed it, Chicago based architect David Steel wrote about the proposed demolition of Sacred Heart at 198 Emslie in Wrecking Buffalo: Garbage, Buffalo Style. Local preservationist and Buffalo Rising writer Mike Puma surveyed the entire list of 68 properties and has recently reported his findings in this Buffalo Rising post. The complete set of photographs for the City's newest landfill candidates is available in Mike's flickr series. On Monday evening, during a recent district stakeholders meeting at the Pratt Willert Community Center, Ellicott District Council Member Darius Pridgen provided this list of 68 properties that are slated for demolition. There are three significant buildings that appear on this list. Sacred Heart Church at 198 Emslie Street, Public School #75 at 57 Howard Street and the City's oldest synagogue which was designated as a local landmark (by the City's Preservation Board in 1997) at 407 Jefferson Avenue. Related: The Bulldozer's New Map - 57 City-owned residential demolitions reported by the Buffalo News on January 29, 2012. Part II: The Bulldozer's New Map - photos by Mike Puma of 30 of the recently announced 57 City-owned residences scheduled for demolition. Last week I posted The Bulldozer's New Map pin-pointing 57 City-owned residential properties that were targeted recently by the City's East Side demolition blitz. That google map mash-up was later picked up here by Aaron Beseker at the Buffalo News. A second set of eyes on many of these properties can reveal some important last minute saves. With that in mind, a local preservationist and frequent Buffalo Rising writer Mike Puma went out and photographed 30 of the properties that appeared on last week's list. Mike focused his lens on the area that Broadway Fillmore Alive blogger Chris Byrd wrote about in Demolishing Polonia. Here's what Mike saw. Still no word on the fate of two West Side City-owned properties that got mixed up with the City's blitz - 298 15th Street and 373 14th Street. Both properties are located steps away from some of most progressive community based housing initiatives. While outside of the City's $1 homestead eligible zone, I'm sure they could be acquired for a reasonable sum. 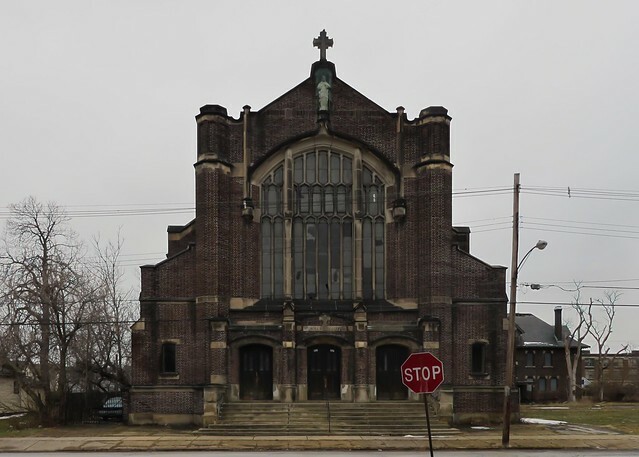 I learned today Housing Court Judge Patrick Carney has recently issued a demolition order for the historic Sacred Heart Church, 198 Emslie Street (google map), currently owned by Rev. Ronald P. Kirk's Witness Cathedral of Faith. Rev. Kirk's congregation purchased the complex, which once included the Sacred Heart School in addition to the church and parish buildings, in 1988. The site's legal description is available here (.pdf). It has sat empty since 2008. After a December 2008 storm the school building collapsed. It was razed in January 2009 in an emergency demolition order to the tune of $160,000. Rev. Kirk and his parish still owe the City for the demolition costs. The church complex built in 1913 is an irreplaceable landmark of the Clintonville neighborhood centered at Clinton and Emslie streets. It was built thanks to the generous price the Larkin Co. paid the congregation to purchase its original site, dating to 1875, in the Hydraulics. With so much progress happening nearby, it simply cannot be demolished. Rev. Ronald Kirk allegedly lives in a 7-bedroom beach estate on Lake Shore Road in Derby, NY (bing map). On March 17, 2011, Buffalo's Housing Court Judge Patrick Carney issued an arrest warrant for Rev. Kirk. As of this afternoon, the arrest warrant remains outstanding. According to this Buffalo News article from December 2009, Rev. Kirk now ministers his congregation at the former St. John the Baptist Church at 60 Hertel Avenue in Buffalo's Black Rock neighborhood. The church was purchased in 2009 for $250,000 from the Plaza Group. The congregation and Rev. 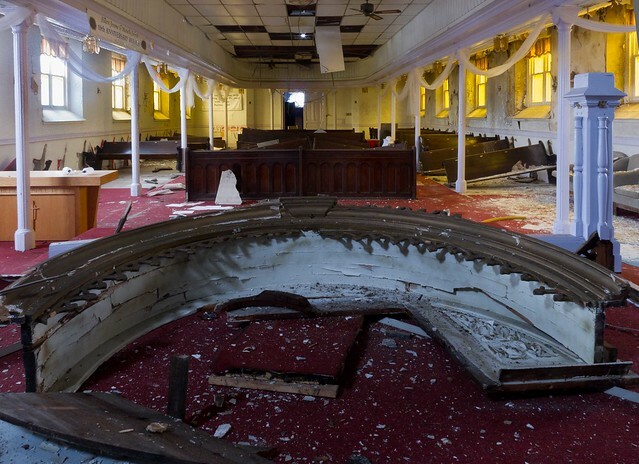 Kirk have essentially abandoned the Sacred Heart Church and have made no efforts to secure the property or make it available for rehab by a new owner. I recently scanned a comprehensive history of the church, which you can download here (.pdf). Check out additional images of this historic site in the Sacred Heart image archive. When will Rev. Ronald P. Kirk and his congregation be held accountable? I met up with LaLuce Mitchell, Buffalo's newest blogger yesterday. His recent graduate work in Chicago intersects with the Buffalo Green Code, Buffalo's effort to implement a form-based code that enhances and protects the City's historic character. fixBuffalo readers will remember this Earth Day post from 2010 profiling Mayor Byron W. Brown's announcement to implement a "green" zoning code. LaLuce is blogging at Re|Form Buffalo. LaLuce wanted fixBuffalo readers to know this: "I'm writing this blog on behalf of Re|Form Buffalo, a new group established to ensure Buffalo gets the best out of the Green Code, its form-based zoning reform. I am a Chicagoan recently transplanted to Buffalo. I hold a Masters Degree in Historic Preservation from the School of the Art Institute of Chicago, where I wrote a thesis on form-based codes and historic preservation. I live on the Lower West Side, walk to work at a downtown architecture firm where I am a historic preservation specialist, and revel in the public life of Buffalo's cafes, restaurants, and cultural amenities." Check in with LaLuce as he keeps a keen eye on what's happening with Buffalo's Green Code. The Brecker Building at 630 High - Loft Living or Landfill? The Brecker Building is a four-story, steel-reinforced concrete framed building constructed at 630 High Street in 1911 to house the J. M. Brecker's Department Store (google map). It is a very early example of steel-reinforced concrete construction, as early as it gets, and is an admirable specimen of progressive architecture in a seemingly unlikely location: the five-points of Genesee, Herman, and High streets. The department store thrived through the 1910s and appears to have downsized in 1925 to a smaller location at 905 Genesee Street. In 1926, just in time for its September opening, the building was transformed into a vocational school for girls ages 14-17, who would attend the school one day a week to learn the "domestic arts" and various womanly trades, such as, among other things, how to work in a department store. The fourth floor of the building was set up as a model apartment for teaching the girls to learn how to be ideal housewives. The school moved to other quarters around 1937 and the building became briefly used as a large indoor market, Mammouth Market Centers, where a restaurant, meat markets, grocers, bakers, etc., set up stalls and sold their goods, but it was not a lasting venture: the building was listed as vacant, briefly, in 1940. The former school was then taken over by the Curtiss Wright Aeroplane Division to house the Curtiss Wright Corporate Training School, a use undoubtedly linked to the war effort and one that may have lasted up to 1945. Chic Maid Hat Mfg. Co. had a good run in the building from 1946 to the early 1960s. From that point forward to the late 1990s, the building housed mostly warehouse functions. 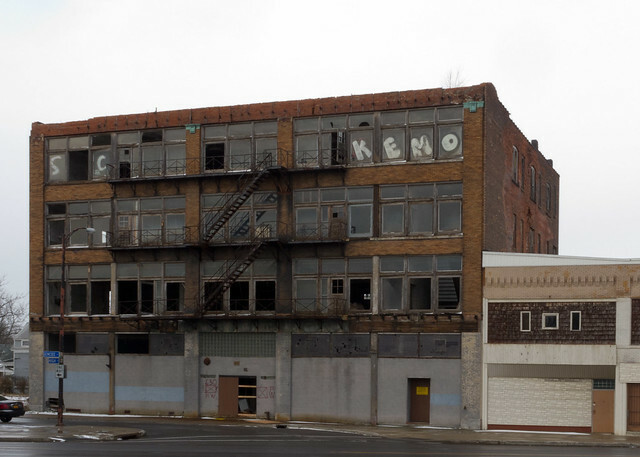 The Brecker Building was in sound condition as late as 2005, around which time the City took title for the building after a period of ownership by a notorious slumlord whose case was detailed in the Buffalo News. Around 2006, the City constructed a very nice curb extension in front of the building, a public investment that validates the inherent value of its location. The building is a block from an Olmsted park, a block from an expressway exit, a mile from downtown, and is situated on arguably the next frontier of private reinvestment in the Near East Side. The building is adaptable, strongly built, is adjacent to vacant land available for surface parking to serve potential tenants, and is along one of Buffalo's most frequent bus lines, the #24, which links to the Buffalo-Niagara International Airport. Nearby, the former Weber's Furniture at 900 Genesee Street has recently undergone a complete restoration, and the former St. Mary of Sorrows R. C. Church, one block to the east, enjoys renewed vitality as the King Urban Life Center. Things are happening at Genesee-High, and future prospects seem bright. An argument for retaining the Brecker Building for future reuse, given current development trajectories, and existing site conditions, is very strong. Currently, the Brecker Building is City-owned. It was recently targeted for a City sponsored demolition. The building's copper trim (see 2005 image) has been stolen and scrapped. The views here are simply stunning. Additional images are available in the 630 High Street flickr archive. I called the number spray painted on the front door of 574 Michigan Avenue the other day (google map). The owner picked up. I talked with him about the property's Housing Court status and his future plans. He told me that the City is applying pressure to demolish this pre-Civil War residence. After exhausting all possible plans to rebuild, he's going to proceed with the City's request. Buffalo Rising covered the house's early history, shortly before the devastating fire. Local architectural historian John Conlin dated the Federal Style residence, steps away from the City's African American Heritage Corridor as a pre-1840's house. According to local preservationist Scott Glasgow 574 Michigan is similar to his own house at 71 Amherst Street. 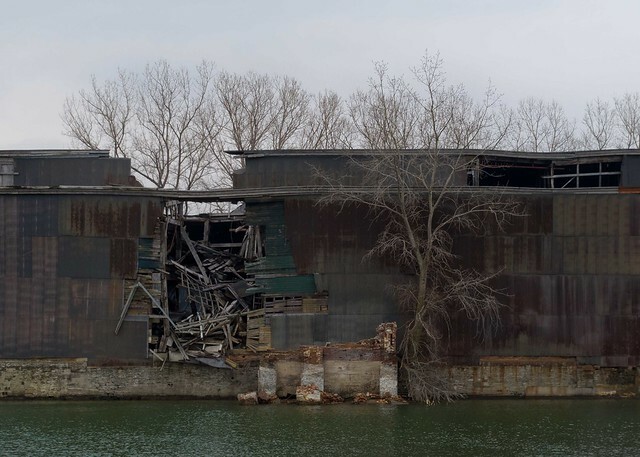 The owner has agreed to allow Buffalo Reuse some salvage rights. According to Preservation Buffalo Niagara 574 Michigan is constructed with hand-hewn beams that may still have some value. The plan is to begin demolition later this month after the owner's last Housing Court date. One of the most targeted and comprehensive demolition blitzes was unveiled by City Hall over the weekend. 57 buildings, mostly East Side City-owned residences are now scheduled for the landfill. Here's the map. With demolition costs hovering around $18, 000/house a number of housing advocates have expressed concern and dismay over this allocation of federal funds. One long time observer sent me the following yesterday. "These funds could be re-allocated and used to establish a renovation or revolving loan fund for interested individuals. How many homes did the City renovate last year? How many were demolished? 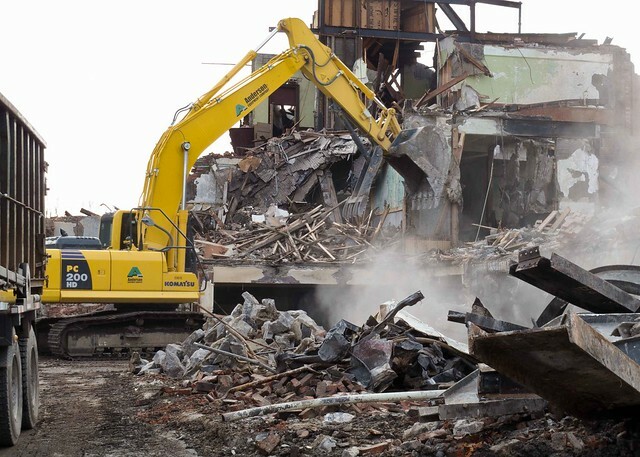 Instead, politically connected demolition contractors continue to do what they do best. Sad." Last November the City's Division of Real Estate asked the Preservation Board for their approval to demolish 24 City-owned houses. A number of these have since been identified as rehab candidates. To my knowledge community advocates haven't had an opportunity or taken a second-look at this new million dollar list. The Buffalo News broke the news over the weekend and carried .pdf links to the targeted properties. 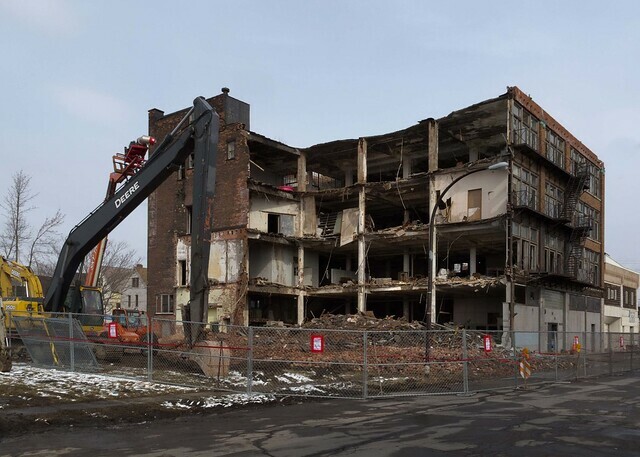 Broadway Fillmore Alive posted about the City's latest demolition plan in Demolishing Polonia and Preservation Ready Sites a new Buffalo based facebook group is collecting part of the commentary. Update: February 6th - The two West Side properties that have been contracted for demolition - 298 15th Street and 373 14th Street (images after those links) - appear to be in good condition and are located a few short blocks away from two of the Cities most progressive examples of neighborhood reinvestment: The Extreme Makeover House and PUSH Buffalo's projects. Both blocks are experiencing a high level of private investment.